​1) "What do we do with older Oracle products we can no longer buy?" "In general, you don’t need to replace older products or metrics if they were purchased as perpetual licences and you are still gaining a business benefit from them. There are a few exceptions. Give us a call if you think you may need to migrate." 2) "Is there a limit to the number of Instances I can have on a server I have licensed?" "No, the server is licensed by the number of processors or users, not Database instances. Drop us an email if you think you need help to understand your usage or checkout our online training courses; www.madora.co.uk/oracle-licence-training if you want to learn more"
3) "Can I use Options with Oracle Database Standard Edition?" "No, with the exception of Real Application Clusters (RAC) which is included in the price of the database for Standard Edition and Standard Edition 2. Contact us if you are unsure whether you are correctly licensed." 4) "Is the minimum number of licences the same for Oracle Database Standard Edition 2 as it is for Standard Edition ad Standard Edition One?" "No, the minimum for Oracle Database Standard Edition 2 is 10 Named User Plus per server. Whereas, the minimum for Oracle Database Standard Edition and Standard Edition One is 5, irrespective of the number of servers. 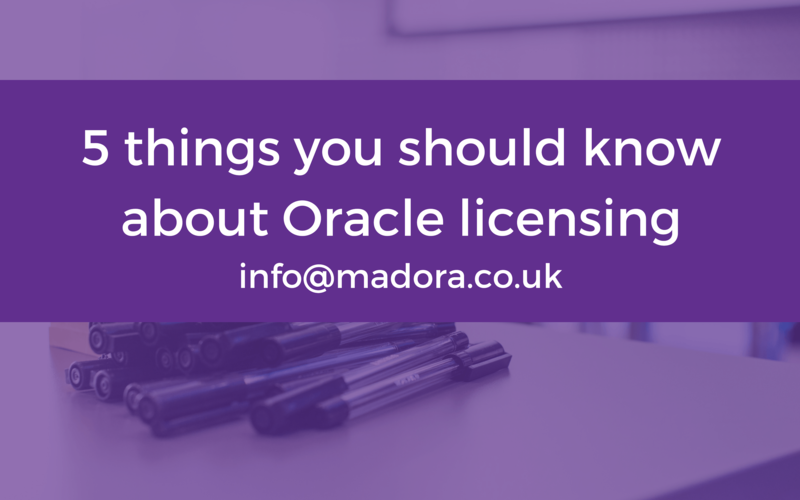 If you are interested in learning more, check out the Madora Academy for our online training courses; www.madora.co.uk/oracle-licence-training"
5) "We use Hyperthreading, does this affect the number of licences we need?" "No, not unless you are using authorised cloud providers, hyperthreading is not counted. Give us a call if you are thinking of moving to the cloud."